While America debates on who to vote into the White House, Erin Byrne discovers the Irish have already made their decision. 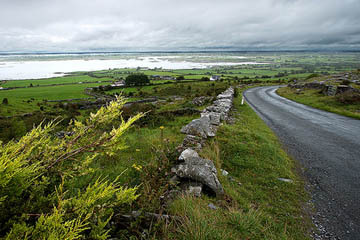 In Ireland, the roads are lined with ivy-covered stone fences and sprinkled with livestock. We’d rented a small car and my husband zoomed up and down hills with brash confidence, our teen-aged sons scrunched up and snoring in the backseat. It was an unlikely place for thoughts of patriotism: a twisting, turning, narrow road under a green canopy in the hills of Ireland. Patriotism is a slippery word in the United States. Dissent is linked to a lack of it, one’s choice of presidential candidate has become a litmus test for it, and the word itself is combustible. During my travels, fielding questions about U.S. actions in the world had left me empty of a response. A fellow from New Zealand wondered why my country didn’t provide healthcare for all its citizens. A Parisian in her small, humble apartment asked why people in the U.S. feel they are what they own. Why are Americans so fearful? Why behave inconsistent in the U.N.? Why refuse the Kyoto accords? Why break the Geneva Conventions? And…Iraq? The United States is a force for peace, I answered in 2002. We care for our people and land in a way that would impress any New Zealander , I feebly explained. As time went on, my responses wavered; they did not correspond with reality. We are confident but do not bully, I insisted weakly. Generosity exceeds greed, hope outweighs fear, compassion is more precious than consumption, and equality trumps injustice, I whispered. I am not naïve enough to think America has always lived up to these ideals, but until the last few years, I thought we aimed for them. By the time I left for Ireland, the simplistic, shark-like twisting and turning of facts that characterizes political advertising was picking up speed, a sign of things to come. As red fuschias, indigo hydrangeas, and green of all textures flashed by the open window close enough to touch, I turned the dial on the radio. Lilting Irish voices cheerfully discussed sport, weather, and world affairs. The broadcast was full of news, analysis, intelligent questions and answers; the Irish version of NPR. I was impressed with the range and thoughtful treatment of issues. They believe he would restore America, in word and deed. I pondered the friendship between Ireland and the United States. The Irish must be wondering, I thought, if we are friend or bully. As our car stalled for a cow crossing, I pondered the friendship between Ireland and the United States. Our histories are woven together as tightly as wool in an Irish sweater. There are between 27 and 34 million citizens in the U.S. of Irish ancestry. Irish soldiers accounted for nearly half of Washington’s Continental army. We’ve traditionally helped Ireland in their struggle against British occupation. I wondered what the Irish thought of our presence in Iraq: the $474 million U.S. embassy in Baghdad; the one in five people displaced by violence; the Iraqi death toll (estimates range from 100,000 to 1 million). This “presence” must remind the Irish of you-bloody-well-know who. The Irish must be wondering, I thought, if we are friend or bully. 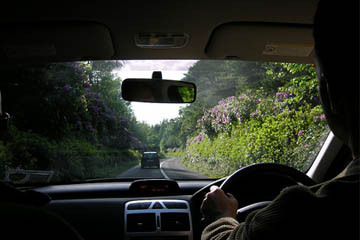 My husband John was determined to “do” the entire West Coast of Ireland, so as we zipped around corners and zoomed past farmhouses, I had plenty of time to be mesmerized by the voices on the radio. Ahr-land was con-sairned over the price of petrol. The ‘Happiness Guy’ (Eric Weiner, The Geography of Bliss) was interviewed: Ireland was high on the list of happiest countries. Should there be a holiday to commemorate the famine? Would Bair-ack Obama get elected? The broadcast consistently bounced back to Barack. On the day we sailed around the paved waves of the Ring of Kerry, I gazed out at the dancing, sparkling blue Atlantic Ocean. I heard a dim voice on the radio and turned it up. “I know how much I love America. I know that for more than two centuries, we have strived – at great cost and great sacrifice – to form a more perfect union; to seek, with other nations, a more hopeful world. Our allegiance has never been to any particular tribe or kingdom – indeed, every language is spoken in our country; every culture has left its imprint on ours; every point of view is expressed in our public squares. It was Barack Obama speaking in Berlin, describing America to the world. I felt my patriotism surge. The engine revved, carrying the little car over the crest of a hill and straight towards the wide Atlantic Ocean, where across the shining sea was my country. Thinking of a trip to Ireland? Check out Ireland On A Budget over at MatadorTrips.com. And find out what 50 other bloggers from around the world think of the US election. The Matador Team is proud to support Barack Obama. Please take a moment to read our official endorsement of Obama for President.